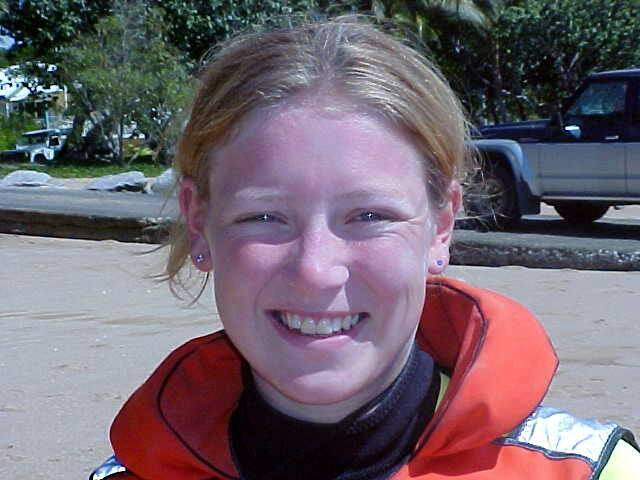 Val Brice, my hostess on Magnetic Island for the coming few days, had already expected me to stay a few days. And of course I had to see and do things on the island to make it a real experience. 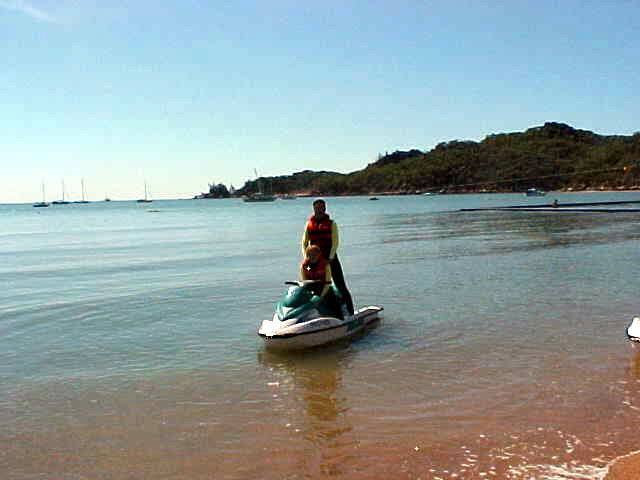 Therefore she had arranged that I could participate in a jetski ride around the island today! With my arrival already in her mind, Val had the local Maggie brochure and called around to see what I could be doing this week. I had decided not to continue travelling without a laptop, because without it, it just is very hard to do any reporting on this website. At 9.30 in the morning Val brought me to Horseshoe Bay, the last town on the island - where the main road ends. At the booth of Adrenaline Jet Ski Tours I was introduced with the tourguide Peter. He was very enthusiastic to meet up with me, because he once saw me on Australian television. 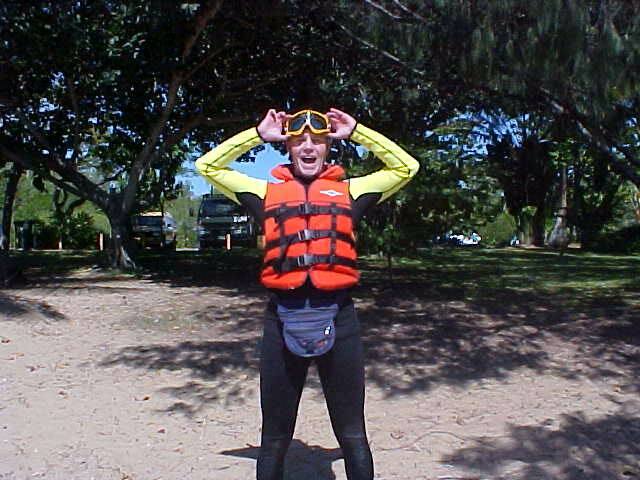 Together with five others I would circumnavigate around Magnetic Island in the coming three hours (only 65km), and Peter couldn't stop telling everybody about my enterprise. Around 10.30 we were ready to go. Peter had given us short instructions on how to operate the jetskis, what to do if something happens and some household rules. 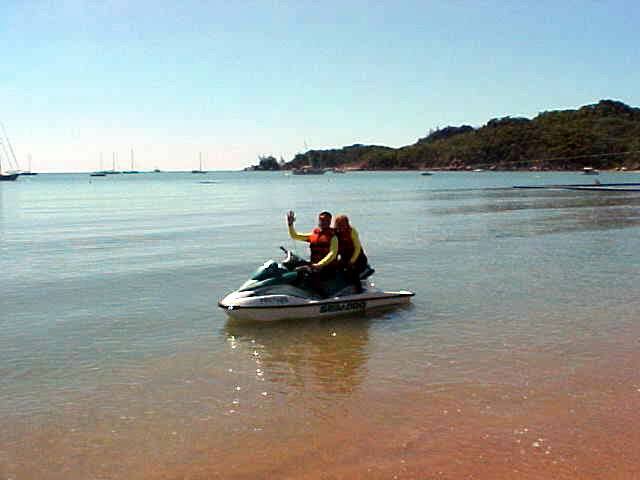 The British Sherry was my co-driver and together we boarded the tandem jetskis on the beach. With 3 jetskis and Peter on his own we started cruising the water, first trying out how it all worked out and how fast we could go (really fast, believe me!). Sherry was screaming her lungs out! From the Horseshoe Bay we turned left around the island, which is mostly remote national park. If you get stranded on one of the beaches at the park it will take you three days to get back to Horseshoe Bay if you are that unlucky. The island exists mainly out of big rocks and you don't want to climb them. 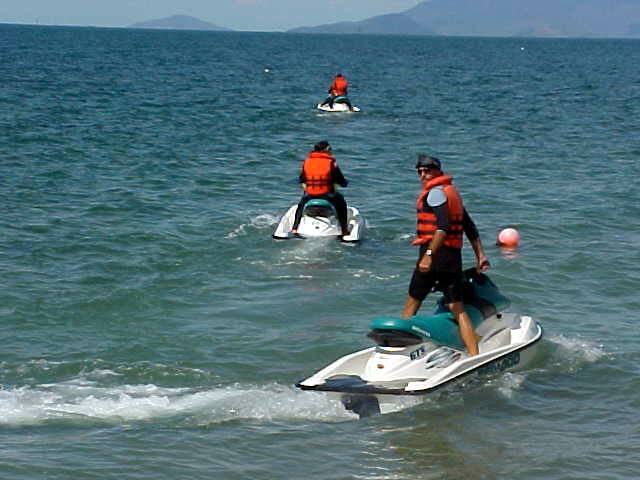 Every now and then I switched with Sherry and we stayed in line with Peter and the other jetskis. We kept our eyes open for dolphins and turtles, but never saw one, unfortunately. 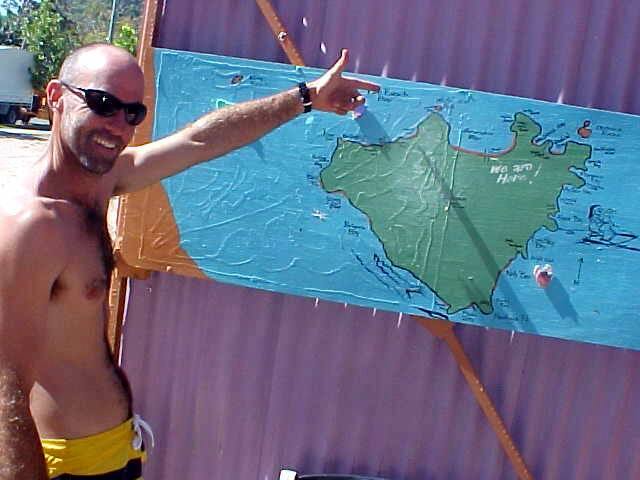 We went all the way around the island and we even got a few hundred meters away from the Townsville beach. This is where Sherry and I leaned to one side of the jetski and where the jetski decided to go the other way and at high speed we were both launched off the jetski, landing in the water some 10 meters away. That was a shock, but when we noticed we were all right and the jetski had automatically stopped, we just had a ball in the deep bay water! Peter came back to see if we were all right and totally wet in our wetsuits (what's in a name) we climbed back on the ski. I was amazed by the hot water. The temperature was some 25 degrees Celcius! It was like a hot spa! At certain parts around the island the sea was rough and occasionally we were literally airborne off the top of waves. Halfway around the island, it was about noon, we had a stop in Nelly Bay where we got onto the beach at the Coconuts Backpackers Resort. And that was a good coincidence, because I am invited to stay here the coming weekend! While everybody was having a drink to get the energy level, Peter and I talked with Rob Evans, the manager of the hostel. Also Rob was intrigued with my project. He just loved it. I enjoyed the atmosphere this hostel had. The hostel is situated right on the beach and hammock hang between the palm trees. Guests of my age were everywhere, reading a book in the sun, swimming around in the pool, etceteras! I was definitely going to enjoy my stay here too! After 30 minutes we climbed our jetskis again and finished the tour around the island at Horseshoe Bay again. Sherry and I were pretty exhausted. However you just sit on the ski and push the throttle, you do get shaken up and down on the thing. 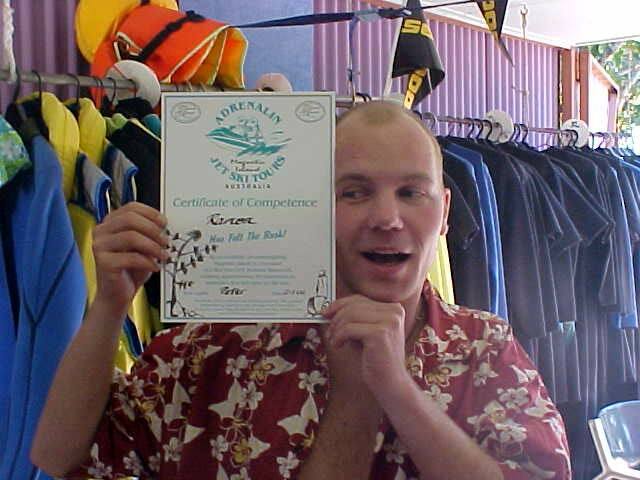 Back at the jetski booth, we took off the wet suits and rinsed ourselves off under a shower. Peter offered everybody a cup of tea or coffee and it was very relaxing to sit down and rethink that great experience. Peter offered to give me a lift back to the house in Arthur Bay and I said goodbye to the rest. Back at the house, nobody else was around. I actually had the entire Queenslander house for myself and enjoyed a run to the beach, a swim in the water (no dangerous jellyfish at this time of the year) and a bath in the sun. Norm and Val work at their Brice Engineers company in Townsville and would be back tomorrow evening as they were going to have their last dinner with their daughter Kelly before she and granddaughter Kylie would fly off to Canada. Val had some leftovers in the fridge and Norm had shown me how their satellite television worked. There were no worries for the rest of the day. This is just pure relaxation.